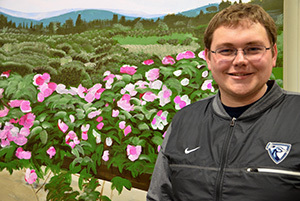 UIU art major Mitchell Erlandson of New Hampton, Iowa, will be among the featured artists during the senior thesis exhibit at UIU’s Bing-Davis Gallery in Fayette Thursday, April 26 - Saturday, May 5. The exhibit will also include the works of Shaquille Hughes, Chicago, Illinois; Kyra Shirk, Mason City, Iowa; and Krystin Noe, Newton, Iowa. The 2017-18 Bing-Davis Memorial Gallery artists’ schedule concludes with a senior thesis exhibit featuring the works of Upper Iowa University (UIU) students Mitchell Erlandson, Shaquille Hughes, Kyra Shirk and Krystin Noe. A reception for the four UIU art majors is scheduled from 4 – 7 p.m. at Bing-Davis Gallery on Thursday, April 26. The public exhibit will remain open during regular gallery hours through the University’s Saturday, May 5, commencement ceremonies. Since his childhood, Erlandson has loved to draw and has been encouraged by his family and friends to become an artist. He began this path by exploring the world of art and learning different approaches in design. After receiving an Associate of Arts degree from Northeast Iowa Community College in Calmar, Iowa, Erlandson transferred to UIU to earn a Bachelor of Arts degree. At UIU, he studied sculpture, painting, graphic design and screen printing. He specializes in sketching with pen and ink, and illustrates his experiences while traveling. Utilizing mixed media, music and woodcutting installation artwork, Hughes challenges each individual observer’s perception of the world that they believe every living organism resides in. Kyra Shirk – Mason City, Iowa – How Does It Make You Feel? Shirk enjoys painting, sculpture and drawing. Most of her inspiration comes from psychology and how people display their emotions and associate colors with different emotions. Following her graduation from UIU, Shirk hopes to begin the process of qualifying to become a child life specialist and eventually work at a children’s hospital. The human psyche has fascinated Noe since she was in a horrific car accident at the age of 18. Suffering from severe head trauma, she lost all recollection of who she was and had to relearn everyday habits. Today, her total recall memory extends from the age of 14. However, a majority of these memories are based on stories told, rather than the remembrance of the actual experience. With parents who were naturally gifted artists, Noe was inspired to study the arts. Most of her recent work has been influenced by the psychological, child-like vulnerability associated with fear. Through the art of mixed media and photography, her lens captures the restlessness beyond the body and unveils the susceptible soul underneath.